Paul Andrews quest for a big bream – a REALLY big bream – finally bore fruit on Bradwell when he netted what most would call the fish of a lifetime...a 14-15 mega-slab! 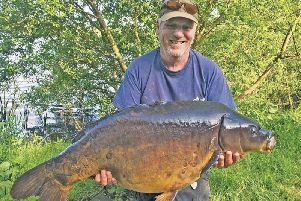 And many will regard his fish as the true record for Bradwell Lake and MKAA – having always questioned the accuracy of the 16lb association record's weighing, three years back. Slabs into early double figures have become almost a routine feature of Bradwell catches in recent years...but this one could mean that there may be a few, albeit a very small number, pushing towards the 20 mark. 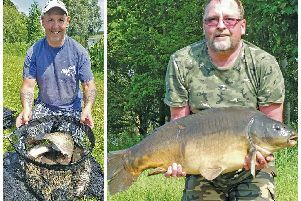 Earlier in the week Tony Richards was more than happy with an 8-12 and Paul Ridgeway a 7-1 – smashing fish in most people's books. STILL on the subject of bream, Roy Crigliano had eight good slabs in a sitting on Tear Drops – before the floods. MOUNT Farm Lake yielded a 28lb mirror to Carl. Darren Mayes had a Black Horse 23-8 while Ade Watson banked carp of 21lb and 17lb Big Pit carp. Leon Butcher landed a 20 on Furzton where Adam Barker had a 19-11 new PB, and John Plested six carp in two hours. SILVERFISH largely kept their distance in Saturday's MKAA Furzton individual league opener with Roger Clutton getting eight bream and a perch for 21lb as Nigel Bass had 8-15 and Paul Hamilton 4-4. OSPREY, Lakeside: Ed Blane 84lb, Ian Sunderland 69lb, Haydon Edwin 49lb. MK Vets, Tear Drops (bream fest): Steve Chilton 31-10, Rob Gibson 19-9, Austin Maddock 19-3. TOWCESTER Vets, Barby Banks: Keith Nightingale 31-4, Les Goodridge 17-4, Chris Howard 16-12. CALVERT, Claydon Lake: Barry Witteridge 10-13, Ben Holdaway 4-2, John Weatherall 2-4. NENE/ Towcester, Silver Lake: Tosh Saunders 5-7, John Balhatchett 3-10, Bob Eales 3-4. LINFORD, C'pn Morgan canal: Mick Hefferon 5-6, Pete Whatley 4-3, John Hough 3-4. SUNDAY's floods ripping through Tear Drops jammed a dead tree in the neck of TD 3 in the process. The Parks Trust responded the incident within 45 minutes of reports to them, despite it being a bank holiday Monday. FIXTURES: June 3, MK canal league final, Pattison Lane; Millie Grace Memorial charity fest, Linford Lakes, June 22-24, two places left. July 1, working party Kingfisher Pit clearing duckweed, all welcome.